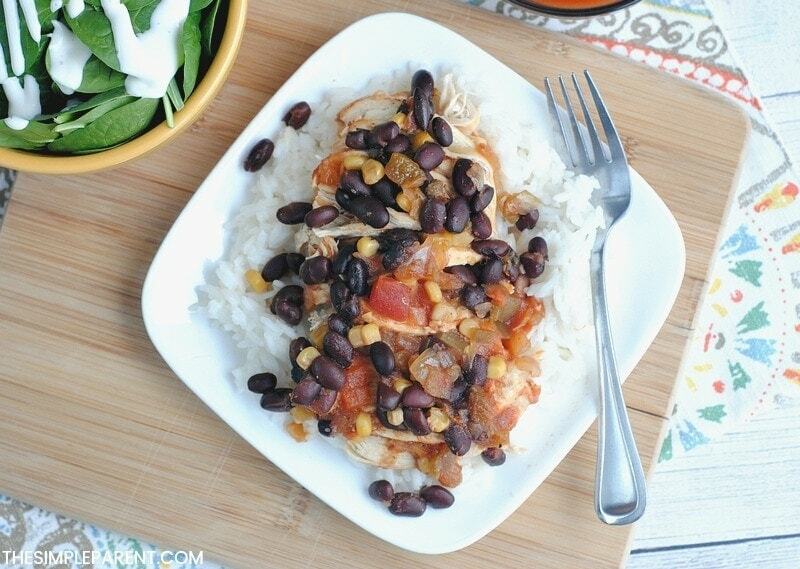 Home » recipes » Slow Cooker Salsa Chicken Makes Dinner Easy Tonight! 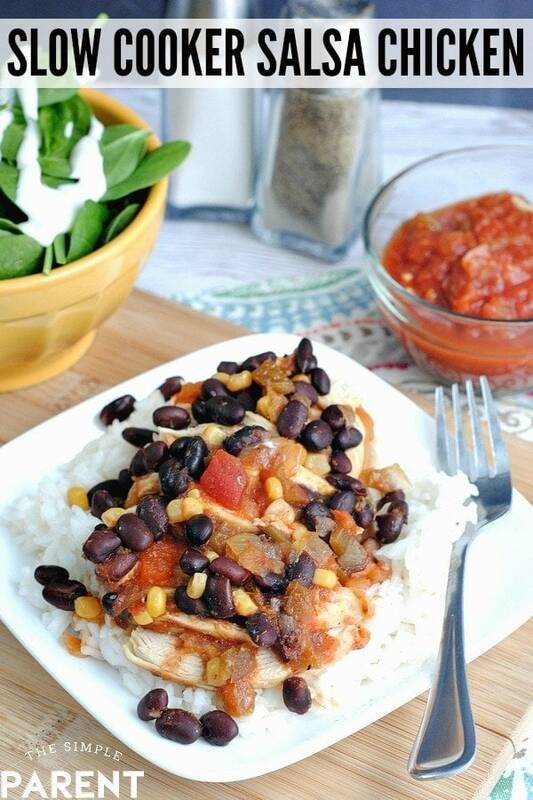 Slow Cooker Salsa Chicken Makes Dinner Easy Tonight! My slow cooker is my hero on the busiest of nights. 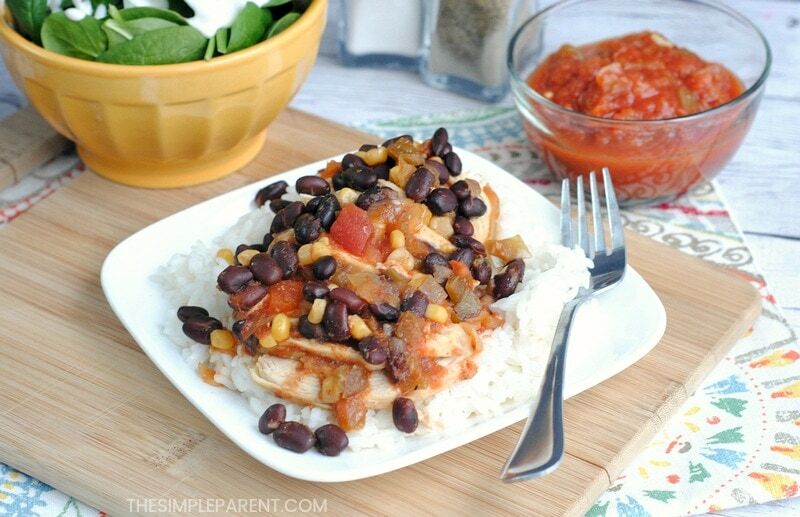 This Slow Cooker Salsa Chicken recipe has been a staple for us for many years. This recipe is in partnership with Mirum and it’s so easy to make that I just knew it was the one I needed to share this week! It’s worked well before we had kids, when I was pregnant (hit some cravings), and is great now that we’re living this busy family life. 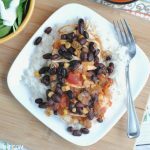 One of my favorite things about this salsa chicken and rice (besides the fact that it’s so easy to make) is that we can tweak the flavors just by using a different variety of salsa! I usually use a milder red salsa because it seems to be the most family-friendly, but I love it with a good green salsa and I’ve even made it with pineapple salsa before. So don’t be afraid to try making Slow Cooker Salsa Chicken with different flavors. It’s a recipe that can be in the rotation every week and pack a ton of flavor! Place the chicken breasts in the slow cooker and salt & pepper to season. 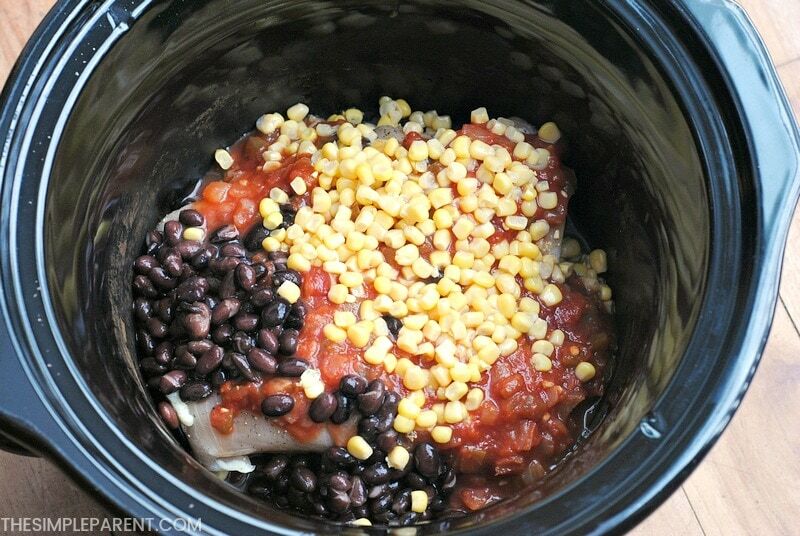 Pour salsa, corn and black beans on top of the chicken. Once the chicken is done, shred and add back to the slow cooker, mixing with the other ingredients. I have to keep it real and admit something though. As I’ve gotten older, salsa gets to me from time to time. No matter how mild a salsa might be, there are times when heartburn hits. It’s miserable and can ruin a great meal. Meals are often when our family usually gets some quality time together. So I don’t need the threat of heartburn lingering over my head and keeping me from enjoying good food with the people I love. There have been times when heartburn has gone beyond just a meal and left me not feeling great. It’s left me hanging back when my family is on the go. It’s kept me from a few things that I didn’t want to miss. So finding heartburn relief that is convenient and works for me has become part of my mom life. Recently I discovered the Omeprazole Orally Disintegrating Tablet (ODT) that works just like the Omeprazole that you can currently get at your local pharmacy. But what I love about Omeprazole ODT is that it’s an orally disintegrating tablet that’s easy to take! It dissolves on your tongue and you don’t need any water! That means it’s great for on the go. It travels well which is great because heartburn often hits me hard when we’re traveling away from home. 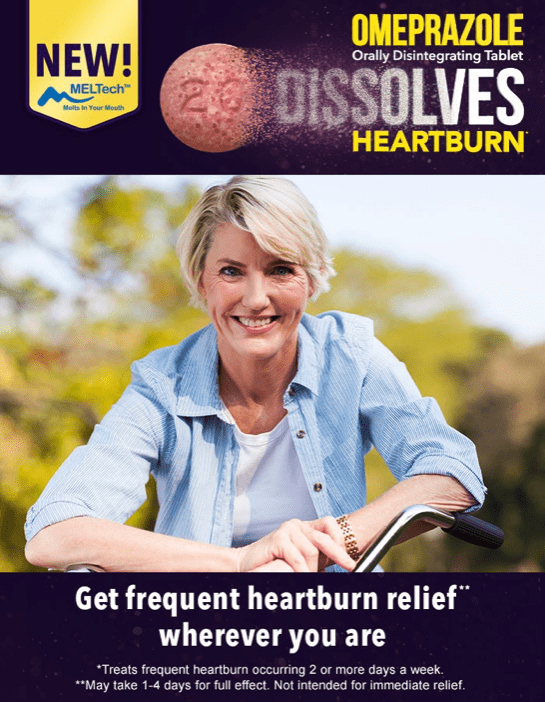 With Omeprazole ODT you can get long-lasting heartburn relief that can last up to 24 hours. If you suffer from heartburn frequently (2 or more days per week), this might be a good option for you. It also has a great strawberry flavor that makes it go down easy. So taking it once a day (every 24 hours) for 14 days is a simple way to get relief! Although some people experience relief after 24 hours, it may take 1-4 days for the full effect and is not intended for immediate relief. 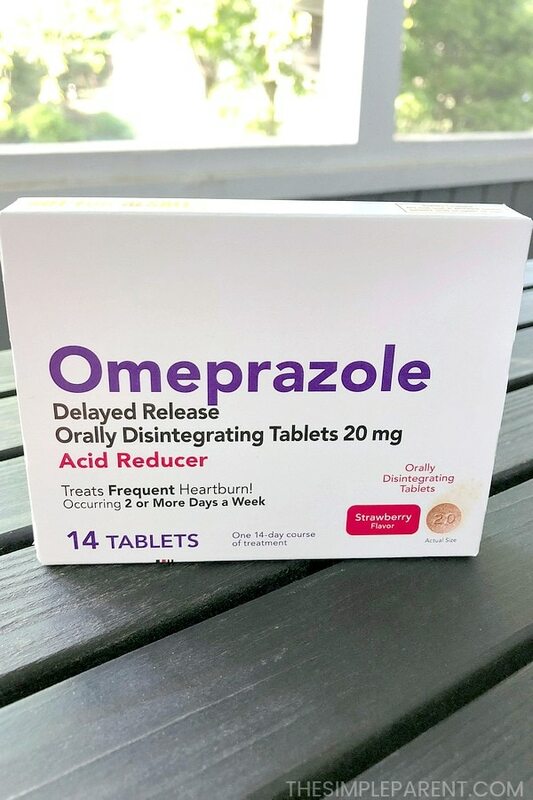 Omeprazole Orally Disintegrating Tablets make it easy to take control of heartburn and get back to enjoying all the good things! Locate a store near you!